Necessity is the mother of invention. I am sure it has brought forward many ideas and solutions to all sorts of problems. Flats fishing at times can present itself as the mother of all problems. Fishing on the saltwater flats is a very demanding and sporting way to fish as we all know. If you have yet to experience the multitude of variables and problems, that you face on a day-to-day basis when flats fishing, then you obviously have not been fishing the shallows very long. Or, perhaps, you may be as lucky as the golfer in the movie “Caddyshack”, who has the game of his life, every time you fish the flats. Cloudy weather, wind, water clarity, tide phase, time of year etc.….you get the point. These are the variables we are faced with daily but doesn’t seem to matter all that much to the game fish we pursue. If they do not like the conditions on the days that we choose to fish, they just have to choose not to show up. This they do more often than we would like to admit. We saltwater flats fisherman, on the other hand, have to choose to fish when our schedules allow or when we are obligated to fish, such as the case when operating as an inshore flats fishing guide. Fishing guides face these natural occurring problems every day come hell or high water as the saying goes and usually have to guide their clients to a trip they may have been anticipating for a very long time. Now let’s add to the problem list. Weather-related issues we have no control over. We have some control over saltwater tackle and other mechanical problems. Now we factor in a whole new dimension pertaining to the angler’s abilities. How well can they handle a spinning rod or bait casting rod, how well do they follow directions, did they forget their polarized sunglasses etc. 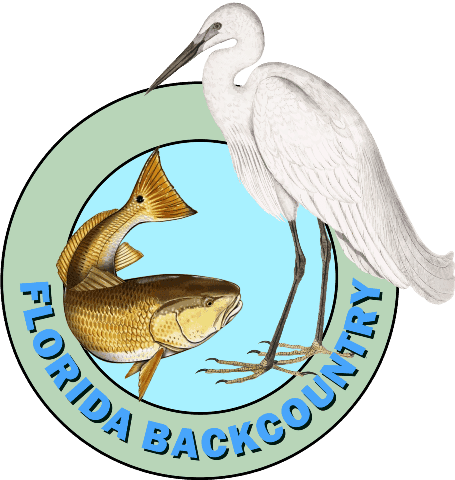 I started out guiding central Florida’s Mosquito Lagoon located within the Merritt Island National Wildlife Refuge back in the mid-eighties and had the pleasure of guiding some very skilled anglers. I also had the pleasure of guiding father and sons of all ages, husbands and wives, moms and their kids and just about every kind of combination. I realized that many were on vacation, maybe their first in Florida and I wanted to make sure they had a very memorable experience and catch fish. Sure they had the extra bonus feature of visiting one of the largest and most varied wildlife habitats in the country. On any given day flats fishing they could and would see manatee, egrets, herons, dolphins, and even the occasional sea turtle and they could possibly catch sea trout, tarpon, jack crevalle, snook or ladyfish but the most sought after game fish hunted on the flats of the lagoon was the red drum or what we all know as redfish. This was central Florida’s answer to southern Florida’s bonefish but a whole lot easier to see compared to the bonefish known as the “ghost of the flats”. Both species are treasured game fish and call the shallow flats their dinner table as they patrol the shallows looking to feed on crabs, shrimp or bait fish. They both exhibit a thrilling behavior that is known as tailing. This is when they have their head down on the bottom grubbing out prey with the tips of their tails sticking out of the water or sometimes even their entire backs can be out of the water as they hunt for prey. The excitement of spotting tailing redfish is equaled by another behavior one will see while flats fishing. Redfish numbering anywhere from one or two to groups of up to thirty to sixty fish can appear from what seems like out of nowhere and can be spotted by a distinct wake they will produce as the fish swim or are disturbed. You will see many other creatures moving about in the shallows like stingrays, mullet (this species will fool the newbie for moving redfish) sea trout (central Florida’s “ghost of the flats” ) black drum and others, but the primary focus is usually on redfish in the lagoon. Red fish and spotted sea trout are very skittish when they venture up on the shallow flats and that is and always will be a BIG problem when pursuing these game fish in a shallow water skiff or even when wading. Any noise you may produce from your skiff or even shuffling your feet too fast on the bottom while wading can easily spook them. Being as quiet as a church mouse is the name of the game in flats fishing and everything matters when stalking these prized game fish. This was a problem that needed a solution and through trial and error I finally came up with what I believe was a solution! South Florida angling pioneers adopted a method of pushing their skiffs when up in the shallows by using the ancient method used by the American Indians to propel their canoes. They pushed them along with a push pole. They used a long straight pole of buttonwood or other available limbs of native trees. Some flats fishing enthusiasts still use buttonwood feet on their state of the art, space-age graphite push poles today. This method of silently pushing their skiffs up onto a flat allowed them to position themselves in range of spotted fish in order to get a cast in front of them with their spinning rods or fly rods. South Florida and primarily the Florida Keys, was the proving grounds for today’s popular flats fishing techniques. Today modern day flats fisherman have gone to an unbelievable extent in trying to achieve silence on the flats. High tech vacuum packed, carbon fiber hulls that generate zero hull slap (the continual slap of water as you move a skiff forward through the water), lightweight graphite push poles, improvement in spinning rods and reels, fly rods and fly line advancements and every kind of artificial lure and fly imaginable are available today. All these advancements are great, and you can have all the latest equipment you can imagine in your possession but once you spot some game fish and you are not silent, you lose…..fish win. I learned this many times over through the school of hard knocks. Poling the flats for an hour or so and not spotting the fish you are after is pretty common when spending a day on the flats in the lagoon. Then, finally, you will spot a good group of four or five tailing redfish......you gently push your skiff into position, your charter clients or fishing buddy gets off a cast and bingo…..success. Ideally, this is the success story we are trying to accomplish, but we all know this is not always the case when flats fishing. We have another problem…. A big problem, your angler’s ability. A lot of my clients had trouble seeing the fish I would point out, and I realized that being elevated on the poling platform allowed me to see more then they could, so we would work the clock system, twelve o'clock straight off the bow etc. I would use boat lengths for distance rather than numbers “Nice red ..two boat lengths at twelve” This would work sometimes but it never worked when I called out twelve and their cast went to three…. I never fished with my charters unless I was asked. Many, many times, after my inexperienced guests made their best attempts and failed, I would ask if I could give them some help and cast to what I have spotted after they try. I would then try to juggle the push pole and try to cast and hook the fish to hand it off for them to fight it in. I needed help and I needed it quickly. I floundered on top of that poling tower for quite some time till I came up with the idea for the PoleMate. I tried to clip the push pole to the tower with what push pole holders were available at the time and grab a rod to cast only to look up and lose what I spotted. Not a good Idea to take your eyes off the fish you have spotted. Also not a good idea to pop your push pole in those push pole holders that are made of metal and attached to the poling tower. They look good but they make noise that reverberates through the hull……remember the problem of achieving SILENCE. I came up with many versions of the patented design, how to wear it, what materials, one piece or two pieces, what seemed like a simple idea took a little more figuring then I thought. Finally, I settled on the present version and included the belt/strap. I found out that if you tied the push pole holder tight against your waist the push pole would pop out when the boat changed position in the current or wind. That’s why we include a belt. 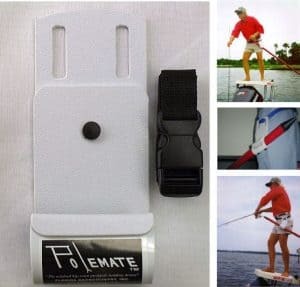 You wear the PoleMate loose around your waist, more like a six-gun, this way when you have the push pole clipped in, you can easily sling it around your waist as the boat moves. This worked out great. I would spot fish, clip the pole in the belt-worn push pole holder, have my anglers make their best casting attempt and if I could salvage the day by hooking a few for my client’s with my spinning rod, everyone was happy. They got to fight a challenging game fish, view the wildlife and residents of the flats and the lagoon, take some nice photos with big smiles…. to say the least, my clients had a great time. 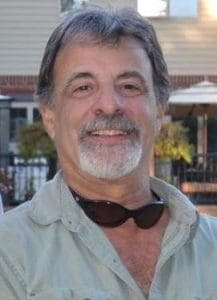 Now when I had a very proficient angler on board I would not even think of trying to hook them up, but when I had regular folks on board who just wanted to have a great experience, it worked great. Oh, I almost forgot to mention. When I go out for a day of fun flats fishing with friends and family, I don’t have to pole them around all day as I did in the past. Now with the PoleMate, I can fish too……and usually out fish em.